Just two years ago opened his Twitter account and Roberto Gómez Bolaños already surpassed the 5 million 'followers'. Follow him good! 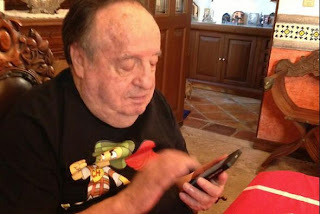 In fact, it was the May 28, 2011 when the comic genius first opened his Twitter account and close their two years of activity on the social network, Chespirito totaled 5 million 316 000 164 followers. The creator of such memorable characters as El Chavo and El Chapulin Colorado, was very attentive to the end of the Mexican soccer, it is stated Americanist heart and kept tweeting during the game. Raul "Choforo" Padilla, great actor and a great friend, you are with God and Chespirito wish Florida. Apparently, Don Roberto Gómez Bolaños has not made any conclusion about breaking the mark of five million. Surely those who will be partying soon are his fans who responded to his call of follow me good!